Because I have a very “busy” item above my mantel . . .
~ ~ I try to keep the mantel decor simple. I shopped the house . . .
~ ~ and came up with this “mantelscape”. 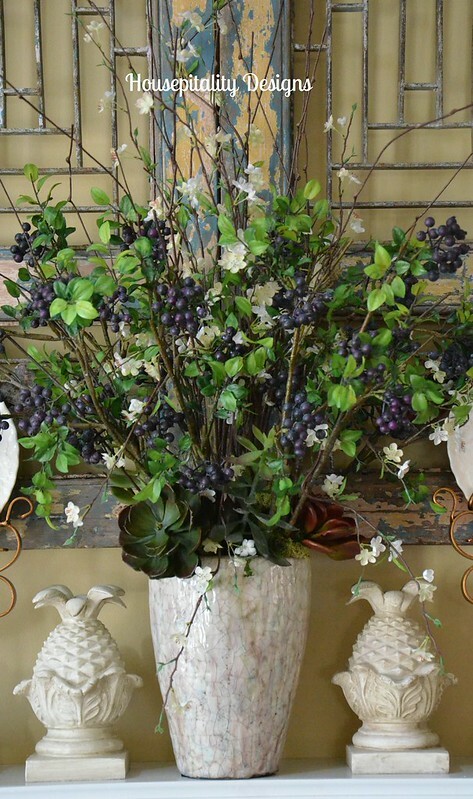 I started out with a vase of twigs and blueberry branches and a touch of white . . .
~ ~ with a pair of pineapple finials on each side. 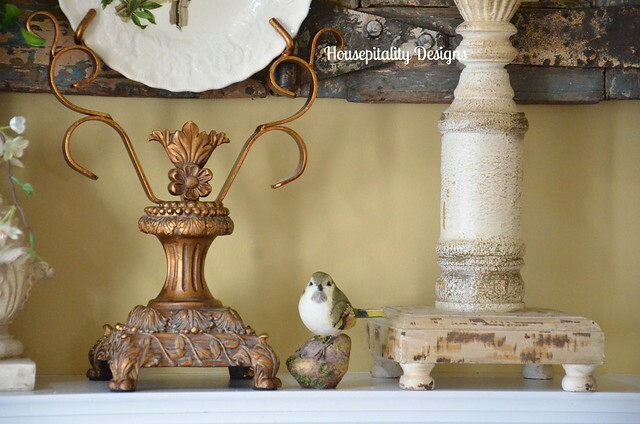 What’s a Spring Mantel without birds . . .
~ ~ so a pair of creamware bird plates on gold plate stands were added. A pair of tall candlesticks from Pottery Barn finishes off the vignette . . . I love a challenge of shopping the house to create a new vignette . . .
Have a wonderful day and Happy Spring!!!! Love those plate stands! Are they vintage or a recent purchase? So pretty. Love those unusual plate stands. Great tall candlesticks. The mantel looks fabulous. Your arrangement turned out wonderful and I love those plates. I’ve never seen a holder to display plates like that before- those are totally unique! Those are some really tall candlesticks- love ’em! I’m always shopping my home- I brought out a few items the other day to my dining table. Happy Spring! Shirley I love the floral arrangement with the pineapple finials, beautiful! Shirley, your mantel is so pretty! It’s looks so fresh and ready for Spring! I adore your plate holders and have never seen any like this. They’re so unique! Have a fabulous weekend! I could look at your mantel even on a dark and rainy day….it’s gorgeous! I love those bird plates, Shirley! I was actually thinking this morning that I need to go up in the attic and get some Easter and Spring stuff down. And I have to find my wood tote, which I think is under the guest room bed. So, yes, I will be shopping the house this weekend to decorate a bit. It’s just a matter of finding where I’ve stored everything! Your mantel is so pretty, Shirley! I love the use of white against your fabulous blue piece. It really makes the spring whites pop without detracting from the gate. So lovely!! 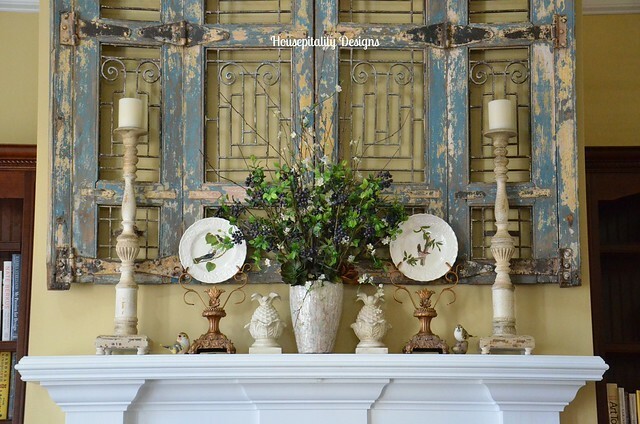 I love how you styled your mantel. It’s just perfect! I love the gold stands with the bird plates in them. I’ve never seen anything like them before. I like how your gate above the mantel ties in well with the flowers and birds you’ve used on your mantel. It all goes together so well. Lovely Shirley!! 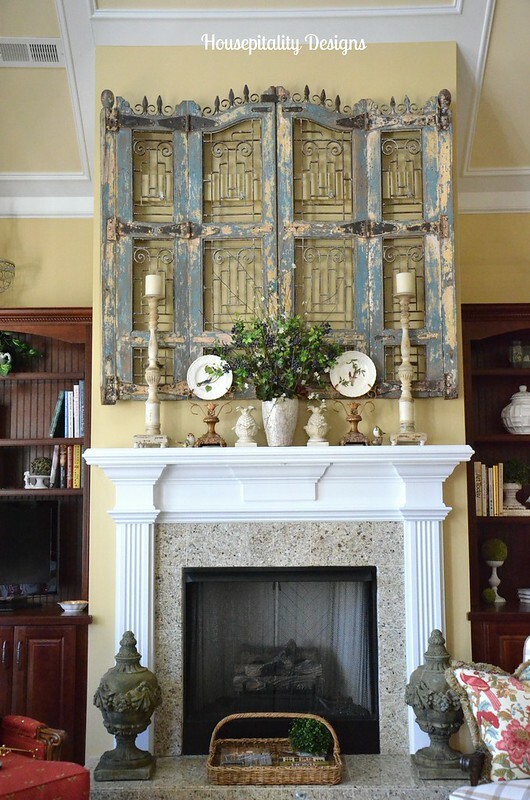 Love the big piece over the mantle and the cream colors!! Stunning, Shirley! I adore those plate holders! The big gate is the most beautiful piece. Thanks for the sweet card! It made my day. You are so thoughtful. Lots of love! Very pretty Shirley. I always love seeing your gates over the mantel. Those are just too awesome. What a beautiful statement those make alone! The vignette is gorgeous. You did good shopping the house. The screen was such a great find. I remember when you installed it! Looking good! Your mantle vignette is gorgeous!!! The gates hung above are so amazing too…. You have inspired me to start taking down St.Patricks Day and shop the house for Spring!! Your home always looks gorgeous. I love the pineapple finials. Where did you find them? I haven’t done any Spring decorating yet. Still feels so cold here and doesn’t inspire me but, soon I hope. Have a wonderful weekend Shirley! Pinky’s recent post…Dining with Birds and Bunnies!!!! Shirley this is gorgeous and I LOVE those plate stands. The nicest thing I have ever seen to display plates. I want them!!! I love it! Especially the old frame behind it all…. gorgeous! Our landscape is covered in snow, so it doesn’t feel very springy 😉 but having fun decorating for spring inside! Just found your blog via Heidi ‘s blog 🙂 look forward to looking around! Happy spring to you too, Shirley! Your spring mantel is so pretty. 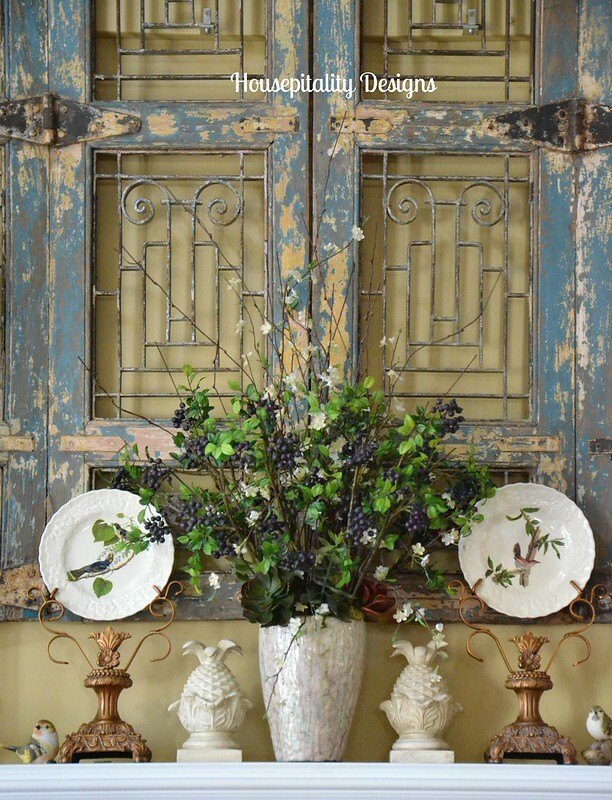 The antique gate makes the perfect backdrop to anything! I love it!!!! LOVE LOVE LOVE it!!! We have our tv over our mantle and I have never liked it there. Makes it hard to decorate. Definitely working on that! I like to shop my house for things, too. If I can’t find it in my home, I head for the Goodwill store or yard sale. Great finds there. Your mantle display looks very Springy. I too love the gate and the color of it. Love those plate holders, sure wish I could find them. Have a Great Weekend!!! Looks beautiful. I love the plate stands , they are so unusual. May I ask where you found them? Have a blessed weekend. You have the perfect backdrop – love the birds – happy spring! Kelly @ Eclectically Vintage’s recent post…Make a Spring Banner and a Tale of Multiplying Bunnies! I love everything on the mantle, it looks terrific. The candlestick are very lovely and the birds. Yes, I shop the house and garage. I’m trying to get my Spring and Easter decorations put together, but I also want to be in the garden. So pretty Shirley! 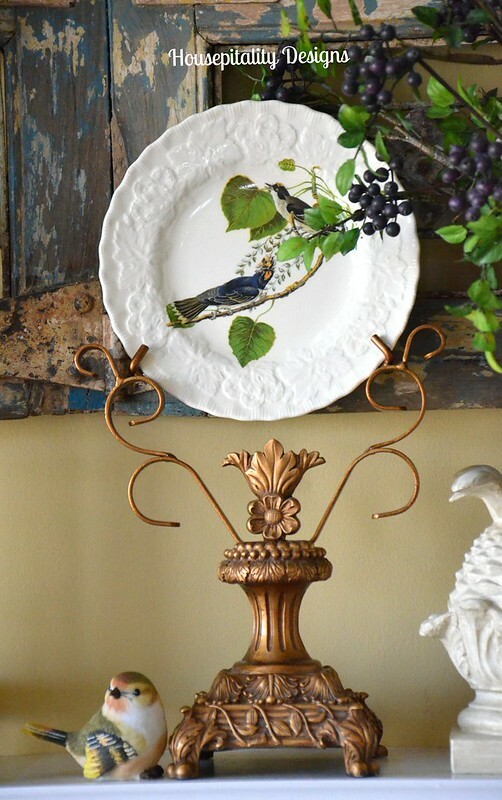 I especially love the gold stands, so unique and such a beautiful way to display those sweet bird plates. Happy Spring, but can’t believe snow is in the forecast again. Wow, talk about impressive! I love your mantel and the arrangement is perfect. Those are very unique plate holders. I love everything about it. Happy Spring. So pretty! I love the large chippy piece you have above your mantel! Very pretty! and I adore that gate!!!! Hope you have a lovely week. That looks perfect Shirley. You know I love that piece, it is very stately and just a touch of any holiday is all you need. You did it perfect! That gate is stunning! I never tire of seeing it. What a fabulous find Shirley. It makes so much more sense to shop the house than to go out and spend time and money on things we really don’t need. It also helps to keep our creative juices flowing and to look at our possessions in a new light. Alycia Nichols’s recent post…Celebrating 85 Years of Fabulous – Happy Birthday, Mom! That blue metal gate piece is stunning. Anything would look great in front of that and love how you have staged your mantel. Those tall candlesticks just tie it all together. Found you at Savvy Southern Style party.